The hunter becomes the hunted in this adventure short story (3330 words) based on a real location in Australia’s remote Kimberly. Discover how a fishing trip in one of Australia’s most remote locations turns into a struggle for life. The sun beat down on rocks that reflected the heat. Another bead of sweat formed on the man’s brow and slowly trickled down into his eyes. The burning sting briefly interrupted the throbbing pain coming from his contorted thigh. This pain is only surpassed by the anger he feels for being in this hopeless situation. It was a name that had appealed to him at first. That and the promise of fishing some almost untouched water. Crystal Creek. Clear flowing streams were hard to find in this remote northwest and corner of Australia. Of course the water hadn’t been clear when he arrived. Experience had told him that clear water and mangrove creeks that cycle through big tides don’t go together, especially not this stumpy backwater. Crystal Creek consisted of a string of soon to shrink freshwater pools above the tidal reach that were the remains of the recent wet season, while the tidal section was a muddy brown watercourse ebbing and flowing between cliffs of jumbled sandstone. The creek was almost strangled at its mouth by dense mangrove stands; it was only big tides that kept it alive. The man had driven hundreds of kilometers from the nearest town over rough corrugated roads and heavily eroded tracks to this spot, magnificent in its beauty and virginal in its isolation. The tall cane grass that crowded the track as he edged his four-wheel drive along the slippery track has suddenly stopped as he dove onto a rocky plain covered with spinifex grass. Ancient baobab trees and spindly gums struggled for survival in thin sandy soil that covered the sandstone bedrock. He guessed only a dozen people a year would make it this far, and this year’s bunch was still a few weeks off as they waited for the dry season to become firmly established and the tracks to dry out and rivers to settle properly within their banks. He was keen, however, and had tackled the washed out tracks and tough creek crossings to be the first into this isolated region. 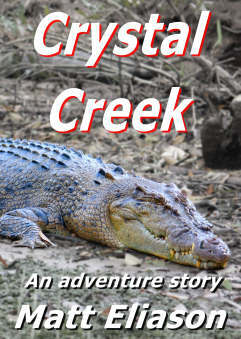 Crystal creek – Click to read online or right click to save to your computer. Please come back here after reading and give your feedback.